The stems are slender, creeping and a green-red color. The leaves has no taste or smell. Ground cover. H: 15cm W: Indefinite. 12cm, 17cm. 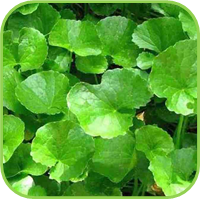 • Ideal to grow in hanging baskets due to its creeping growth habit. • Like Ginseng as a tonic for longevity (Ayarvedics) – Indian saying: "One or two leaves a day, keeps old age at bay"
• Lower body temp, Fever. • Mildly sedative (from the pair of saponin glycosides: brahmoside and brahminoside): Stress relieve, Anxiety, Trauma, Mood swings, Sleep disorder – insomnia, relaxation. It creates a state of balance, clarity, and peacefulness. • Hair growth and treatment for baldness, nail growth. • Builds lymphoid tissue. 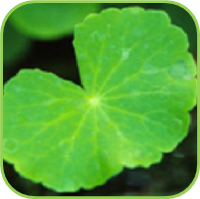 Lymphedema (Insufficient lymph drainage) – Gotu Kola increases blood flow through the veins by enhancing the integrity of the surrounding connective tissue. • Blood diseases, blood purifier. • 2-3 cups per day. • 2 tsp dried herb powder in a small amount of water. • 10 ml, 2 x per day. 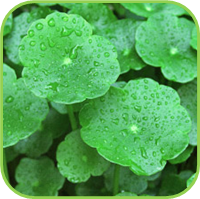 • Skin rash (dermatitis), sensitivity to sunlight and headaches are rare side effects – if experiencing these symptoms, reduce the dosage or stop using the herb.